For a decade, much of New Zealand's economy has been enjoying a Tolkien boom. 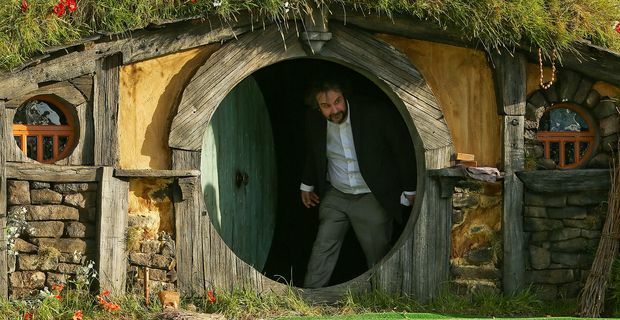 Peter Jackson's epic adaptations of The Lord Of The Rings and The Hobbit have made the New Zealand scenery world-famous and kept Kiwi actors, caterers, truck-drivers, make-up artists, hairdressers and hundreds more in gainful employment. It might be the end of an era though as filming wraps on the final instalment of Jackson's Hobbit trilogy. The director promised to live blog the final day of filming in Wellington after two years of continuous work. The second movie in the trilogy, The Desolation of Smaug, opens in December. The final instalment, There And Back Again, is scheduled for release in December 2014. "I've been lying here in pitch darkness, watching fight rehearsals over and over again," Jackson added. "I'm looking at the fights, figuring out the angles I'll need to film them today. A huge amount to do, and it needs to get done." There has been some concern in New Zealand about the extent to which the government has been involved in funding the films. The production received a $67.1m tax rebate and a $46.9 million production grant. The government argues that it is worth it, being responsible for 8.5 percent of visitor arrivals and creating 3,000 jobs paying out around $1.5 million a week in wages. The tourist authority obviously agrees, investing nearly all of its annual $65m budget in advertising with a Hobbit theme. They couldn't really do much more, short of renaming the country Middle Earth.